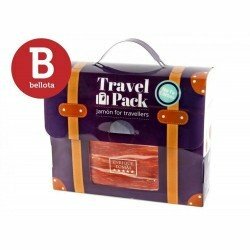 We present you a very comfortable travel pack with 1.4 kilos of sliced ham shoulder, from an iberian pig fed with acorns, a product with an intense flavour that will not leave you indifferent. Enjoy a wonderful Iberian ham shoulder with the comfort of having it sliced in individual sachets; Enrique Tomás' Travel pack is ideal for a special gift and to taste the best ham with the security of paying just enough for the maximum performance of a ham piece. 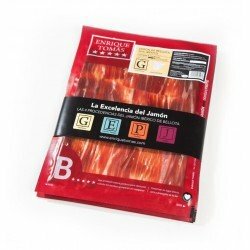 At Enrique Tomás we invite you to enjoy one of the jewels of our gastronomy, the Paleta de Bellota Ibérica, a unique product that can only be made in the Iberian Peninsula, ideal for jamón lovers who want to taste a cured ham full of nuances. Elaborated with the front leg of Iberian pigs, our acorn-fed Iberian ham is an ideal product for the maximum enjoyment of the senses. Available only in the Iberian Peninsula, the pigs of this breed are fed with feed until they reach the first 100 kilos, then they are taken to the pasture to make the final fattening phase eating acorns, herbs and wild plants for 4 months. 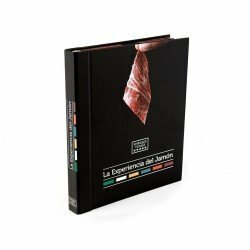 This breeding together with the genetic particularities of the animal, gives a unique flavor meat, with a shoulder whose fat has infiltrated the muscle resulting in a piece of veined, juicy and oily with a touch that is exquisite to the palate.